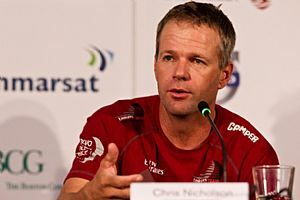 The teams forced to retire from Leg 1 will come out fighting in Leg 2, according to Camper with Emirates Team New Zealand skipper Chris Nicholson, who sees reliability as a bigger factor than ever in the Volvo Ocean Race. Team Sanya, Abu Dhabi Ocean Racing and Puma Ocean Racing powered by Berg all failed to finish the first of nine offshore legs and are working hard to get their boats ready for the in-port race in Cape Town on December 10. Camper finished the first leg in second place and came through with relatively little damage — a good sign as far as Nicholson is concerned. "The guys who got knocked out in leg one will come back harder than ever in leg two," Nicholson wrote in a blog on the CAMPER site. "Put it this way, if it was us I’d take it as an opportunity for us to step up and prove that we’re not out of the race. "This is such a long race and good and bad luck as such can happen to anyone at any time. It’s a hoary old cliché but this is one competition where you can take nothing for granted." Camper crew got their boat back in the water in Cape Town on Monday, which puts them in an enviable position compared to, say, Puma, which is not due to arrive until Tuesday night. "I’m not saying we’re any better or any worse than the others, but we’ve done everything we possibly can to ensure that the type of breakages we’ve seen so far don’t happen to us," Nicholson said. "Only time will tell if we’ve got that formula right. Ultimately, though, I was not hugely surprised by the level of attrition we’ve seen to date. These are not the same Volvo (Open) 70s of previous races and any comparison to earlier races is a bit pointless. "Just like Formula One, each generation is finding ways to go faster and faster and as you push the envelope more something has to give. So it’s not a surprise that we’re seeing a great level of breakages. "What this does mean, is that a focus on reliability is more important than ever before. We’ve had some relatively minor mechanical issues during the leg and believe me, by the time we leave Cape Town, these will be so well fixed, checked and double checked that it’s not funny.